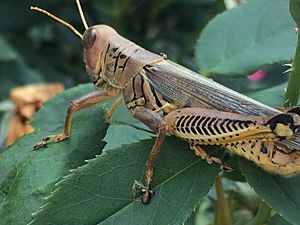 A grasshopper has an open circulatory system, where hemolymph moves through interconnected sinuses or hemocoels, spaces surrounding the organs. Arthropod blood does not carry hemoglobin. Haemolymph (hemolymph) is a blood-like fluid in the circulatory system of insects and other Arthropods (spiders and crustaceans). Molluscs also have a similar circulatory system. Insects and their relatives use a molecule called haemocyanin, which does the same job as haemoglobin does in vertebrates. Haemocyanin has a greenish colour, not red. The insect circulatory system has no veins or arteries. Their haemolymph moves around in the space called the haemocoel. The organs sit in the haemocoel and are bathed in the haemolymph. The 'heart' is little more than a single tube which pulses (squeezes). Haemolymph Facts for Kids. Kiddle Encyclopedia.